Out on a wide river tonight, candles float. Little floral platforms of light and hope. And, as they cruise by at surprising speed, they carry worlds and dreams of calm. These fresh carnations of an ancient ritual delight me. Especially since in the foreground it is white light and cars and noise and fireworks and speaker distortion and the nouveau riche keeping their SUV engines running while they get out to release delicate paper balloons to the skies and more floral, fragrant floats to the waters. It is only we foreigners who want the old of Asia, I remind myself, cautioning against the arrogance of the jaded. But still, beyond the sound and fury, candles flicker forward along their elemental journey: earth bearing light on the water in the still, dark air. 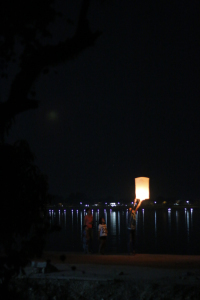 These thoughts and musings, scrawled in my (e-) diary while sitting on the stairs of our wooden cabin home on the banks of the Mekong River in SE Asia during the recent festival of Loi Kratong, mock me now. My esteem for the ways of the past, upset in that collision of Old-meets-New Worlds, is not so different, I suppose, from those who still go on (and on and on) about the beauty of print, lamenting the death of books and of journalism. “YOU. CAN. HAVE. BOTH!” I want to scream from the highest tower. “Peer out the window of your ivory one. Look with fresh eyes.” So much noise and column inch about such a non-issue. Yet there I sat that night in my comfortable conceit, thinking that old fragile ritual was compromised by its proximity to modernity. That somehow the blessings those paper lanterns carried would evaporate in the glare of the New Modern Gadget Car. That the bamboo rafts with their elaborately folded leaves could not remain candle-lit and fragrant in an atmosphere of this generation’s party music. Books: paper or not. Journalism: on paper or not. Still buoyant on unseen currents.